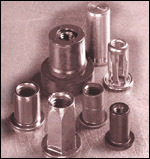 Rivet Holdings Limited was incorporated as a stockholder and distributor of blindside fixings and fastenings. For those not familiar with the industry, the reference to blindside simply means fixings and fastenings that can be secured with access to only one side of a product. Whilst the nature of the business and it core market is basically the same, the strategy and structure of the business has been recently overhauled to capitalise in their chosen specialist market. The company is an authorised POP© rivet master distributor and recognised in the industry for it technical knowledge and experience, coupled with its attention to detail and consistently high levels of service. This is borne out by the number of enquiries received through the industry for advice concerning numerous applications from designers to manufacturers. Rivet Holdings Ltd is committed to the quality of its products and services and are an ISO BS EN 9001:2015 registered company. The company has a wide and varied range of customers, including traditional light manufacturing automotive, rail, aerospace, electronics, domestic appliance, HVAC, construction and numerous service businesses. Whilst it developed a strong local and national base it also now has an international presence. Whilst the core business will continue to supply rivets and fastenings as its core product, there is a a further focus on additional value added services such as air tool repair and maintenance , with more recent developments looking towards tool sales, facilitated by hire and maintenance. Amongst others, the company had early approaches regarding its repair and maintenance services, from the likes of major automotive, rail and aerospace manufacturers and can now boast a quality core customer base.